Benedictine College, a customer of MobileUp Software, has launched a new mobile strategy to increase student engagement in events outside the classroom at the school’s campus in Atchison, KS. Research suggests at least 75 percent of college students consider themselves dependent on smartphones and one in five describe themselves as “lost” without a mobile device. The Student Activities Office at Benedictine recognizes this trend and uses the MobileUp Software platform, including a school-branded app, to educate its student population about events on campus. After a soft rollout of its app at the beginning of the school year, the office used the annual homecoming events this fall to drive adoption of the app and engage students in the festivities. "Our students are used to getting information from their phones so our app made the distribution of details about our homecoming events easy and effective," said Elizabeth Carey, Director of Student Activities at Benedictine. "The interactive contests we put in the app generated a lot of participation and competition among the students and added to the excitement of homecoming on campus this year." The homecoming promotion also grew the app’s users by more than 1000%, providing the office with a larger installed base to receive the office’s information in the future. More information about the Benedictine College app and how it was used during the school’s homecoming are available at the MobileUp website. Visit https://www.mobileupsoftware.com/blog/benedictine-homecoming/ for details. MobileUp Software builds affordable, customized apps for Android and iPhone that engage students and alumni of higher education and K12 schools as well as members of professional associations. The company delivers a full set of administration tools to help its customers build content, establish geofences, and deliver notifications to their mobile audience through a custom-branded app. Reporting and analytics provide data on app usage and user participation in events to help MobileUp customers make better decisions about content and programs. The company’s website is http://www.mobileupsoftware.com. 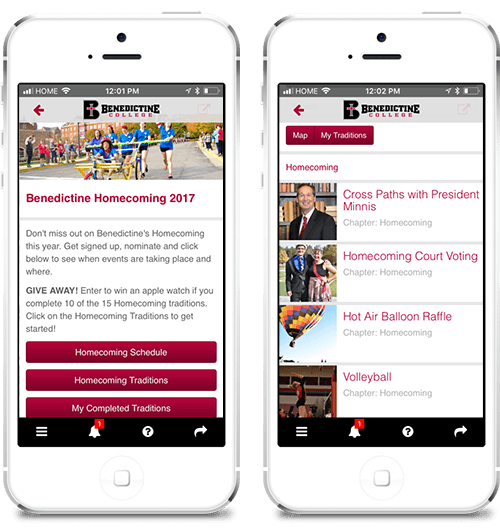 Benedictine College uses a custom-branded app from MobileUp Software to reach students.These screens show just some of the content that was used to engage students in the school's homecoming activities this fall.